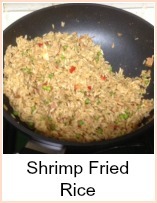 Here are a couple of chinese seafood recipes - both using prawns (shrimp) and simple to make. Th second recipe is quick to cook - you will need to get your ingredients prepared before you start cooking. Chop and measure everything - have them ready in small dishes, plates or in piles on your chopping board. This way, you won't overcook things whilst you're preparing the next addition. The secret to fast chinese cooking is to have the heat high and keep moving the contents of the pan - a wok is good as it gives yoo space to move things around rapidly without throwing it all over the cooker top - but if you've only got a large pan, then just be a little more careful with your stirring and tossing. Blend the cornflour to a smooth paste with 1 tspn of the water. Put all the ingredients (apart from the prawns) into a large frying pan - as it's Chinese you might as well use a wok - and bring to the boil. Simmer for 2 minutes, add the prawns, heat through and serve immediately. Lovely with rice and a stir fried vegetable. Heat a large frying pan or wok. When it's hot, add about 1 tbspn oil. Add the garlic and spring onions and stir fry for about 30 seconds. Add the pepper and stir fry a further 30 seconds. Add the sauce ingredients, bring to the boil and simmer for about 4 minutes. Add the water chestnuts and prawns, heat through for about 1 minute and serve immediately. Plain boiled rice is good with this. 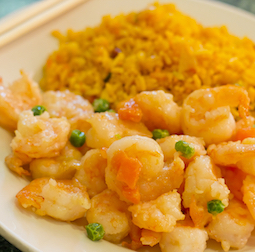 Tasty Chinese Seafood recipes - sweet and sour shrimp and braised shrimp. Quick to cook so have your ingredients all ready chopped before you start.